Do these new images show off a new Rider, or is it just a well-made prank? Since it’s April Fools Day scans and rumours have been popping up recently, 99% of these are almost certainly fake. However, these images have really stood out among the rest and probably has the highest chances of actually being real. Supposedly, this is concept art from the new season of Kamen Rider to be aired late this year. While it is still best to take these images with a grain of salt, they’re still really well made and worth talking about. The first image shows a nameless new Rider with a handful of its forms, one of them being a base form and the others being combinations of three previous riders suggesting that this is an anniversary season. Similar to OOO, the three riders that make up the form are all set to a certain body part, either the head, torso or legs. The first of these new forms is a mix of Stronger, Kabuto & Blade, the second being a mix of Shin, Gills & Amazon, and the last one being a mix of Mach, Accel & Lazer. What’s interesting is that the riders that make up the forms all have a common motif. The riders that make up the first form are all based on the Japanese Rhinoceros Beetle, the Riders that make up the second form are all mutant-type Riders, the Riders that make up the last form are all Secondary Riders based on motorbikes. This means that other forms will likely also consist of riders with a common theme. With this in mind, it’s going to be fun to speculate what new forms could be made out of what riders. Personally, I would like to see a form made up of Riders that started off evil and eventually redeemed themselves (Zangetsu, Genm & Chaser), all female Riders (Poppy, Marika & Necrom P) and Riders that are controlled by two people (W, Den-O & Drive). Above the Forms is Eyecon like devices that are supposedly this season’s gimmick, three of the devices represent the new Rider’s base forms while the other eighteen represent the other Riders. Unlike the OOO medals, the devices don’t seem to have any indication of what body part they are used on, possibly meaning that they could be used in any order. Along with the previously mentioned forms, there are also forms representing Knight, Baron & Brave (Knight themed Secondary Riders), Beast, Kaixa & Ixa (All Secondary Riders) and G3, Drake & DiEnd. Because the Secondary Rider forms seem to be connected to the main rider, it could suggest that this season will only have 1 rider. Dark Drive & Dark Ghost, Idunn, Mars & Kamuro or New Den-O, Nega Den-O & G Den-O). 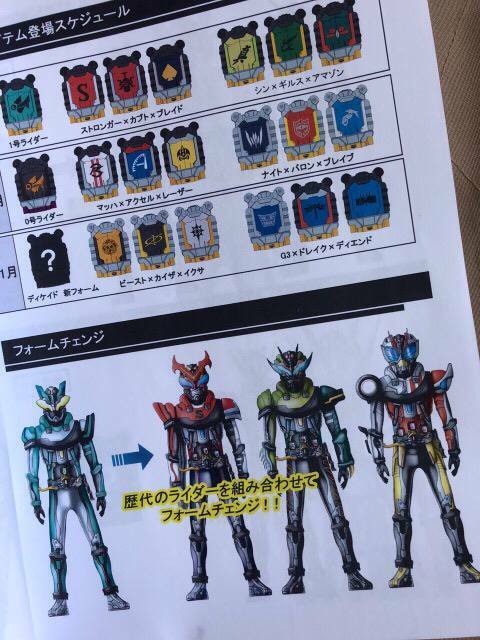 The final image shows brand new forms for different riders, supporting the idea that the Decade themed rider might be Decade himself. The new rider forms are Kamen Rider Cyclone, A new OOO combo with an insect theme, Fourze Launcher States and Zangetsu Jinba Melon Arms. Since this is likely an anniversary season, Riders from Wizard and Drive-Build would also likely get new forms. I would personally like to see Necrom get his own equivalent of the Mugen Damashii or a Super Dead-heat Mach. So, Is it a fake? Because of the time of year, It probably is. The Background seems a bit plain for a catalogue and some pages have information missing (Price and/or release date etc.) and it’s also quite strange that some images don’t even show the full page. However, it’s art style is really similar to other art shown in real catalogues so I wouldn’t be surprised if it ends up being real. We’ll probably have to wait until the summer to get proper confirmation but this could be a look into what the final Heisei Rider Season could be like. Do you think this is real? What forms would you like to see? Let us know in the comments! Previous post: Kamen Rider Girls to Perform Live for their 7 Year Anniversary!